The Photoshop Interface and some of the tools you will need. Now comes the fun part. 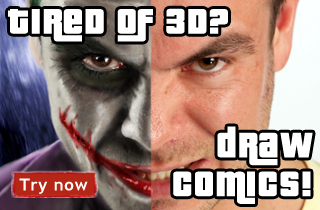 There are two basic ways to create textures for your 3D models. One way is to paint them and the other is to use high resolution scans of photographs. We are going to utilize both of these techniques. If you do not have a high resolution camera or a scanner just paint everything. To use photographs either from a digital camera close up of someone's face or scanned from a magazine cover always create with the resolution set at 300 to capture the highest amount of digital information as possible.•Tip: When using scanned images from magazines, only use the covers of the magazines. The quality of the prints on the inside of most publications are not good enough for usable texture creation. 2. Click: Image > Image Size and in the pop up menu set Width = 2000, Height = 2000 at 72 pixels/inch. 3. Press Ctrl+0 that's (Ctrl+Zero) to fit image on the screen. 4. Click > Image > Mode > RGB Color. 5. Since we are only concerned with the head neck and shoulders you can delete all of the body parts that will not be seen by using any of the selection tools like the "Lasso" With the background color set to white, select the body parts that are not needed and either delete or fill (Ctrl+Backspace) with white. 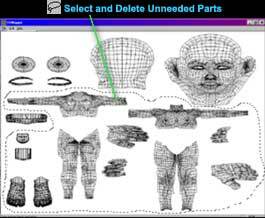 Leaving all the parts of the body that will show up in your scene like the neck and chest, teeth, and eye lashes. 1. File > Open (Ctrl+O) find and select image file. Use the "Lasso" or other selection tool to select the face in your image then copy (Ctrl+C) and paste (Ctrl+V) or drag with the "Move Tool" (V) over to the UV Map file. Set the opacity of the face image layer to around 78%. Ctrl+Click the face image layer in the layers palette to select it. Then press: Select > Transform Selection or (Ctrl+T) and hold down the Shift key (to constrain proportions) while you drag one of the "Resize Corners" until the eyes are as close as possible to the ones on the UV Map. Remember to reset the opacity back to 100% before saving. •Tip: Try to line up the corners of the eyes and mouth of your image to the corresponding corners of the UV Map and don't worry about the rest. •Tip: It is a very good idea to hit (Ctrl+S) or, File > Save after each step to save your work. 2. You may need to make separate copies of the lips and eyebrows to be able to position them precisely. If so, Use the "Lasso" to select and copy (Ctrl+C). Click the "New Layer" button on the bottom of the layers palette then paste (Ctrl+V) Double click the layer to select it and line up each part with the "Move Tool" Use the "Free Transform" (Ctrl+t) to resize or skew to the correct size. •Tip: With the "Free Transform" tool if you hold down "Ctrl" you can pull one of the corners to skew on an angle. 3. Saving Face- Click the "New Layer" button and with the background color set to white, fill (Ctrl+Backspace) the layer. Drag the Face layer above this new white background layer in the Layers Palette so the face is on top of the white layer. Hide any visible layers buy clicking the Hide/Show Layer Eye so all you see is the face on a white background. Reset the opacity back to 100% before saving. Click File > Save As or (Shift+Ctrl+S) name the file Face.psd (save in .psd or .tif file format). 4. Repeat this process with the eye's (keep left and right eye's together) eye lashes, lips and teeth if they are visible in your image. The neck, chest and collars can be painted or photo overlaid together. Save each part in it's own named file 2000x2000 at 72 pixels/inch. Close Photoshop.